This evening I attended an art opening in the Thompson Rivers University gallery, Kamloops, BC. Two fourth year students, Megan Gamble and Bo Yeung, have been working without much sleep over the last week to create a very ambitious installation. They spent the last several months collecting urban cast-offs and hoardings so that they could renew the materials by building an environment in the gallery. The smell of sagebrush and dry leaves lures visitors to the exhibition. As I walked through the door of the gallery I encountered the fanciful scene of a river constructed out of broken mirrored glass. It was connected to a playground slide that was resting flat on the floor. To my left was a cosy small dwelling with two chairs, a trunk, a jar of pencils and a pencil sharpener (there were curled pencil shavings on the floor) and a vintage radio was resting on the windowsill spilling radio talk and sound into the room (I may escape to this room for a quiet moment over the next week). The gallery space is full of delightful meanderings and passages that invite the viewer to enact a fanciful narrative as they walk, or pause, in and around the space. The exhibition is titled ‘Reckon’ and will be up until Friday 22 October, when visitors are welcome to return and offer to take materials home with them to continue the process of renewing and re-purposing. 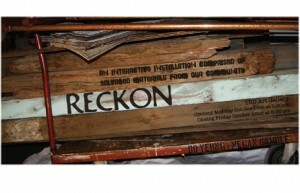 An interactive installation comprised of salvaged materials from our community. Opening Monday September 18th at 5:30pm. Lovely treats for the eyes & tummies, bring you’re friends & bring your Mommies. deconstructing the interactive installation Reckon. Come find what can be of use to you, and celebrate!